With a new mayor, Seattle is again off on a journey of discovery. Will we get what we voted for? Jenny Durkan drew laughter after being sworn in Tuesday by promising that if a big snow hits Seattle, she’d deal with it. If you were here in 2008, you’ll remember then-Mayor Greg Nickels got pummeled for not clearing the streets after a large snowfall. People (obviously) still bring that up as an example of how one decision in a crisis can turn people against a mayor. But ongoing problems matter, too, and add up. I had to park some distance away from the Ethiopian Community Center, where she was sworn in, and walk about four minutes along Rainier Avenue South. It was raining lightly, but the sidewalk was flooded in many places. Even if it had been dry, a pedestrian would have faced rough patches where tree roots had raised the sidewalk. I also had to step around a dead rat. Madam mayor: You are going to be a very busy person. Being mayor has to be one of the toughest jobs in politics. It requires understanding wonky processes, inspiring and cajoling people to move toward a vision, dealing with crises and tending to the tedious nuts and bolts of running a city. And you have to do that while being a lot closer to the people who will be affected by your actions than, say, a president. Seattle is about to see how Jenny Durkan handles the job. She looked and sounded the part Tuesday at her swearing-in, and she promised to get the actual work right, too. Durkan started out by spreading her swearing-in events among several Seattle neighborhoods rather than holding the event at City Hall, as is usually done. The Ethiopian Community Center was her first stop, and there she promised to be mayor of all of the people, not just City Hall, the point that her visits to several neighborhoods was meant to emphasize. The different locations also make a point about the diversity of needs and wants she’ll have to negotiate because there is never a way to give everyone all of what they want. Once an administration moves past Day One, decisions will have to be made that will please some and displease others. During the campaign, it appeared to me that Durkan sometimes gave ambiguous answers to questions about issues that could divide potential supporters. Sometimes it felt politically expedient, sometimes if felt like a genuine desire to be nuanced. (Should the city open more homeless encampments? Maybe, was the gist of her answer.) Either way, there will be many times when she’ll have to take a stand, even when it’s hard to know what the outcome will be. Watching that unfold is really the only way to know what kind of mayor she’ll be, and it’s the accumulation of hard decisions that will come to define her for residents. 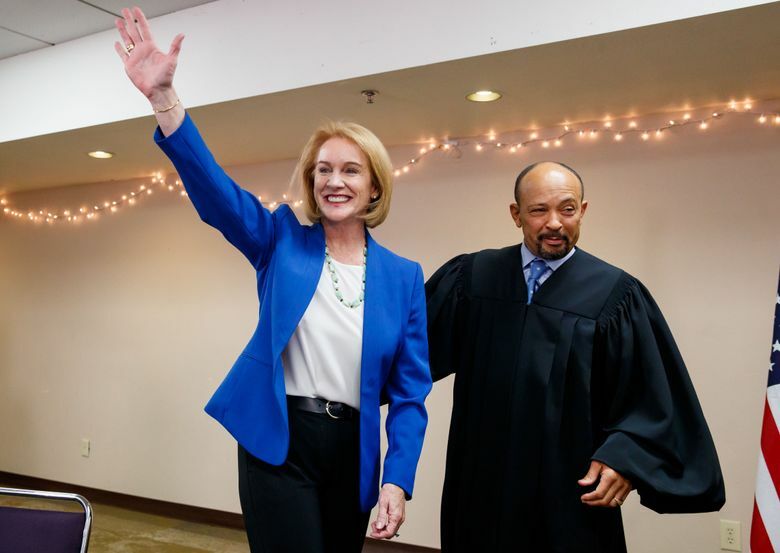 Durkan began taking steps toward her vision Tuesday by issuing a couple of executive orders. One of them is intended to give help to low-income families trying to pay for housing. The other directs staff to examine how the city’s Race and Social Justice Initiative is working. One primary goal of that initiative when it began a decade ago was to “ensure racial equity in city programs and services to make tangible differences in people’s lives.” It was supposed to do that by 2017. But today the city still has wide gaps in household income, in health outcomes, in education that follow racial lines. Seattle is a thriving city for some, but not for all. Clearly, new thinking and action are necessary if we are going to get closer to being a more equitable place. Durkan also said she plans to offer all of the city’s high-school graduates two free years at a community college. Mayor Durkan faces a long list of urgent problems caused by rapid growth. She mentioned affordability, transportation and infrastructure. Those are going to continue to be a pain for some time, no matter who sits in the mayor’s seat. Durkan joked that, “If there were easy solutions, the city would not have elected a woman again.” This, as you know, is only the second time that has happened. Bertha Landes was the first, in 1926. U.S. District Judge Richard Jones, before he did the swearing-in, made a prediction for the new administration. Let us all hope he is proved right.